optoblog.com » Blog Archive » Free Speech in Your Practice? Free Speech in Your Practice? 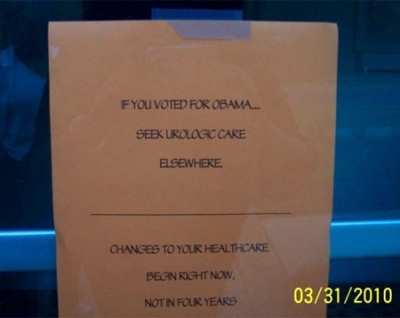 A urologist posted a sign at his office, and some people are going nuts. Obama voters not wanted as clients. So…I’m not sure I would pick that fight because I just want money in exchange for services, but if I felt that a certain person or entity were actively fighting against me obtaining patient volume and deserved fees, then yes, I would have to push back. This doctor also put some literature in his waiting room about the negative effects of Obamacare and its timetable. Holy cow, imagine the left’s vitriol if you stuck a Bible in your waiting room! I put NRA magazines in my waiting area, and guys love them! I also put National Geographic in there too. You know, just to keep it balanced. I think it’s the doctor’s right to put any decent reading material he wants in the waiting room. No one is forcing them to read it. They can take their business somewhere else if they want. I’ll bet 80% of my patients don’t even know what magazines I have in my waiting area since I don’t like to keep people waiting. I’m still participating in Medicaid until it doesn’t make it worth my while. I don’t really agree that there is such a thing as government sponsored-medicaid, but for now I think of it as getting my own tax dollars back. Anyway, I reserve the right to express my political, economic, and religious views to anyone who will listen, inside or outside the clinic. Just because I’m a doctor doesn’t mean I can’t be active in causes I believe in. However, I don’t think people pay me to preach to them. I’m pretty sure they came in for an eye exam. Plus I don’t have time to go off on political or religious rabbit trails because I hope the next patient is almost done with their paper work. I don’t care what a patient’s political/religious/etc philosophy is. I don’t care if I have to speak to them in English or Spanish or through a family member interpreting, I just want a fee in exchange for a service, and I want to perform as many exams per day as possible. Comments Off on Free Speech in Your Practice?